Students from government schools and Karen Education Department (KED) run schools took part in the annual Karen student fellowship event held on January 18 in Pai Kyone Twonship, Pa-an District, Karen State. According to Saw Rainbow, organizer of the event, the fellowship is aimed to improve relationship and friendship between local schools. The fellowship organizing committee invited students and teachers from both government schools located in Kyaw Kay Hta and Ta Lae Basic Education Middle School. Saw Rainbow said that the main difference about this year’s event held in Ta Eu Khee Hta was that Karen students in the government system school joined the event. Saw Rainbow said that having contact with each other in the old days would have been unlawful, but he said cooperation with the teachers and students from government schools shows that schools under the different systems can cooperate. A total of 400 teachers and students from 16 schools – Ta Eu Khee Hta, Klay Mo Khee, Mae La Ah Khee, Mae La Ah Hta, Si Poe Khee, Mae Kae, Wa Mi Klar, The K’haw, Maw Poe Khee, Waw Kyaw, and Maw Poe Kay Primary schools and Middle schools under KED and two schools under the government’s system participated. 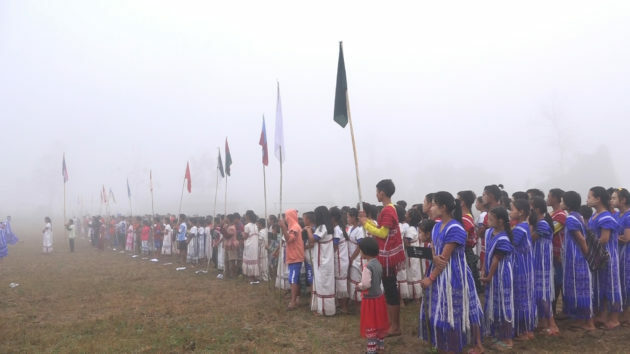 Organizers said that the three-day student fellowship event, held from January 18 to 20, included competitions such as football, Chair-Ball and a running event held during the day while traditional dance, singing, skit, traditional sewing and drawing competitions held in the evening. Saw Hsa Kue Ku, a student from Si Poe Khee school said he had great time at the event. With the goal for students to build confidence in themselves, to love the education and to value the culture, Pai Kyon Township Karen Education Department (KED) has been organizing the student fellowship every year in Wa Mi Kla village tract, Pa-an District. This year is the 16th anniversary and the first time that government schools cooperated.